Within the palace, the reasons for her unpopularity sprang mainly from jealousy. With Gabrielle monopolising Marie-Antoinette’s time and affection, no-one else could climb the social ladder and become the Queen’s new favourite. 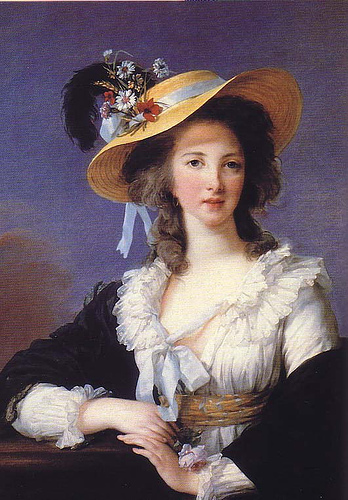 Many a failed socialite would utter the cry of the insidious and vile Madame de la Motte, who complained in her memoirs, “To be sure, one could hope for presentation to the Queen only through the Polignac clique, but the Duchess, jealous and fearful of losing the royal favour she monopolised, disdainfully repulsed any outsider who sought so much as a smile or a glance from the Queen… I was outraged by the attitude of this haughty and imperious woman. Well could I remember the Polignacs in Paris when they were impoverished nonentities”. Gabrielle therefore became a useful scapegoat for any aristocrat who wanted to say they didn’t enjoy the Queen’s favour because the Duchess controlled all access to her; not because they themselves were too boring, annoying or unpleasant to actually win Marie-Antoinette’s much-coveted friendship. Outside the palace, Gabrielle took the place of the royal mistress in public opinion. The French had a tradition of blaming all the mistakes of their government on the King’s mistresses, rather than on the kings themselves. Even today, we have an ugly tendency to get angry when a woman, no matter how capable, seems too close to a powerful man – as poor Hillary Clinton found to her cost during her husband’s presidency. However, both Louis XVI and Marie-Antoinette were too clean-living to provide the country with paramours to blame. In Marie-Antoinette’s case, anti-monarchists responded by simply making up hundreds of accused lovers – including animals, children and transvestites. They also, increasingly, insisted that she was having affairs with Gabrielle de Polignac and another close friend, the Princesse de Lamballe. Marie-Antoinette, with rather touching innocence, wrote to her mother that she was mainly being criticised in the gutter press for having a taste for lovers and a taste for women. Which rather suggests to me that the sheltered young royal wasn’t aware that she was actually being accused of combining the two categories.